Nose: Lighter than the 10 yo with vanilla, banana and a wee hint of peat. It’s sort of dusty but also fresh with some citrus (sour orange). I’d say it lacks the more robust body of the ten (or the 100 proof), and of course, the sherry influence is nonexistent here. Nonetheless, it’s a very good nose. Palate : The palate feels nicer and deeper with a nice touch of peat, Pepper and earth. Some nice wood influence too (Virgin wood, right?) As well as spices and a hint of fruit. It’s not Ultra complex, but it feels well integrated, and lovely on the palate, again, the deep smoky notes with the sherry I liked so much on the 10 year old, are gone, but something else is present, mainly fresh wood, and dustiness. Finish : Dry and earthy peat. Pepper. Quite long. The Good news is that the Organic does not disappoint. it is well integrated, offers a nice malt / peat / fruit balance with a nice touch of the virgin casks. However If I had to choose between this or the standard 10 yo (which is a bit cheaper, by the way), I would choose the latter any day as it displays more of the “old school” whisky characteristics I’ve learned to love so much when enjoying the 10 / 100 proof. Anyways, a worthy whisky. 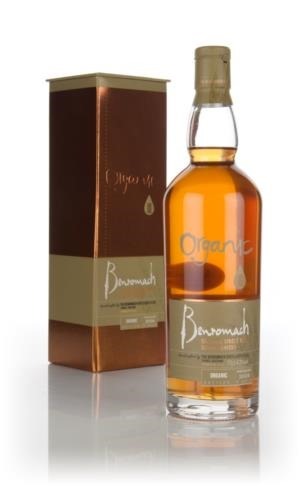 Good work (Again) by Benromach. If organic whisky is important to you, this is a no brainer, get a bottle.